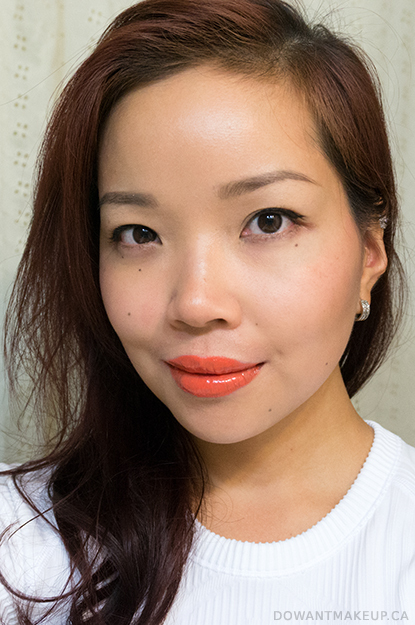 You folks know how much I loved LUSH's The Kiss lip scrub--it was one of my favourite products of 2015! After such a good, lip-smoothing experience, I wanted to try another lip scrub, this time from their permanent (available all-year) range. Popcorn was the obvious winner, because who doesn't love popcorn? 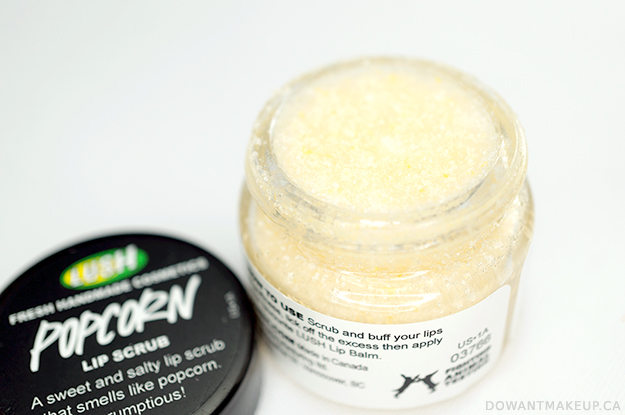 Popcorn lip scrub gets its name from the inclusion of corn meal in the formula to help scrub off dead flakes, along with castor sugar and fine sea salt. The coconut oil and jojoba oil from the scrub also help keep lips moisturized. I love the sweet and salty smell, like salted caramel corn, and similar to LUSH Let The Good Times Roll cleanser. While the sprinkles and hearts in The Kiss were cute and very Valentines-appropriate, they didn't do much for my lips; Popcorn is way more functional without that stuff. The ingredients list does include fizzy candy, but I've never noticed it and am not sure it does anything. At least it doesn't get in the way of a good lip scrubbing! The pale yellow scrub does not leave any tint behind. I use a clean, dry, cosmetic spatula or similar tool to pick up and deposit a pea-sized amount of the scrub on the back of my hand and work it into my lips with my fingers. I avoid scooping product from the jar with wet fingers because the moisture can cause the scrub to clump up. I use it weekly (because lazy) but it can be used more frequently if needed. Lastly, although you can lick off the product when you're done (due to the edible ingredients), I prefer to just gently rinse it off. 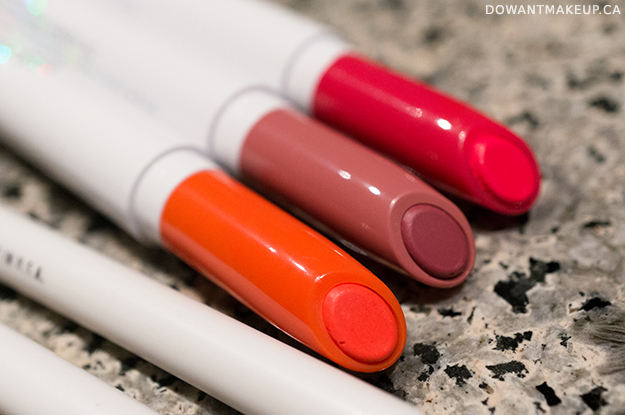 It's perfect for prepping lips, especially before using a matte lipstick for smooth, even application. Lately, my favourite combination is to use Popcorn and then apply SkinCeuticals Antioxidant Lip Repair. Smoothest lips ever, seriously. 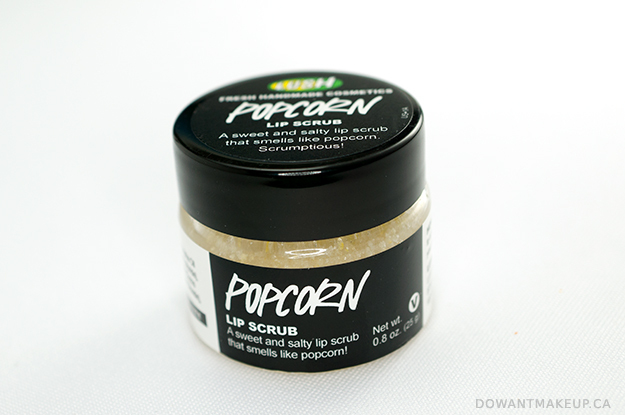 In addition to Popcorn, LUSH also has Bubblegum and Mint Julips available year-round, but I think I love Popcorn too much to stray. 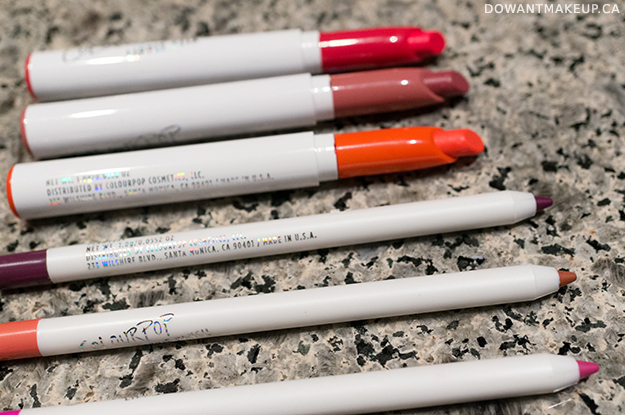 Which one would you use to keep your lips flake-free?